SINGAPORE - The first year of a government scheme to spur Singaporeans to pick up skills saw more than 126,000 people benefitting from it. They learnt a diverse range of skills - from baking bread to developing mobile applications. The SkillsFuture Credit scheme, which was introduced last January for more than two million people, gives Singaporeans aged 25 and older an initial $500 credit to pay for skills courses. SkillsFuture Singapore (SSG) revealed in an update on Friday (Jan 6) that some 34 per cent of those who tapped on the initiative last year used it more than once. 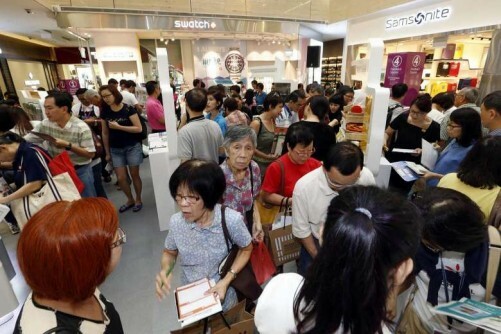 About 63 per cent of the SkillsFuture Credit users were aged 40 and older, said the statutory board. Information and communications technology (ICT) was the most popular training area across all age groups. Minister for Education (Higher Education and Skills) Ong Ye Kung said he also signed up for an online course in data analytics, but does not intend to claim the credits. It's a refresher for him as data analytics, which used to be known as econometrics, was his undergraduate discipline. "It's 20 hours long and I am going through it slowly, whenever I have some time, such as when I am on the exercise machine," he wrote. Older Singaporeans tapped their credits to learn simple skills such as using basic computer functions, while younger Singaporeans enrolled for courses on emerging skills such as data analytics. Other popular training areas include language skills, productivity and innovation, and security and investigation. The credits do not expire and will be topped up periodically, so they can be accumulated for more expensive courses. Hoping to equip himself with emerging skills, transport planner Zhang Weisheng used his SkillsFuture Credit on a data visualisation and communication course last year. "I wanted to upgrade my knowledge, and I was quite convinced that this is an area that would be relevant in the future," he said. The 31-year-old, who is now pursuing an online course in Java programming, noted that there are many courses Singaporeans can use the credits for. "It is a small encouragement for people to go out there and upgrade themselves," he said. National University of Singapore economics lecturer Kelvin Seah said the scheme's uptake is encouraging. He added: "It signals that people are receptive to acquiring new skills and knowledge that could potentially help them perform better in their existing and future jobs."